Sign up to receive our weekly blog! By doing so, you’ll not only be informed about the home automation industry, but also learn various ways you can make your smart home smarter. 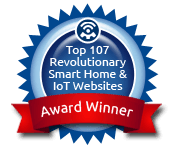 Or if you’re new to home automation and just want to learn about smart devices, our blogs can certainly help you get started. We won’t bombard your inbox with constant messages either, we promise. Our goal is to provide you with high quality blogs, many of which are written by our own professional tech support team. Home Controls reserves the right to remove any comment or user from our blogs – although we have no duty to do so. When comments are deleted, it’s usually because they violate one or more of our house rules. Repeated violation of these rules may result in the suspension of your commenting privileges. We don’t allow obscene, racist or sexually explicit language. Personal attacks are not permitted. We reserve the right to remove comments that are abusive, hateful, or defame or insult anyone. We also reserve the right to remove comments that are off-topic or not in English. It is illegal to harass or threaten anyone. We take threats, harassment and stalking very seriously. Comments that might be construed as such may be deleted and made available to the proper law enforcement officials. You may link to other informational Web sites when relevant to the discussion, but links to commercial sites are generally not allowed. We may make exceptions when the sites in question are pertinent to Home Controls. You may not suggest or encourage illegal activity. Home Controls will assist law enforcement officials in any investigation of such activities. Choose a username carefully. You may not use names that are offensive, that suggest illegal activities or that are meant to imitate other users. Any such names will be blocked from commenting on our blogs. You must have copyright ownership of all material that you post on our blogs. No articles, recipes, song lyrics, art or graphics may be posted without the express written consent of the copyright holder. If you’d like to refer to a home automation article from another site, please post no more than a few lines summarizing the article and include a link to it. You must respect the privacy of individuals. This means no posting of phone numbers, addresses, social security numbers or any other private information. We discourage users from posting such information even about themselves, as we cannot control how that information may be used beyond our blogs. Good manners online means that you don’t post the same comment more than once. The online word for posting many times on one topic is “spamming.” We don’t allow it. You participate at your own risk on the blog. You take responsibility for comments under your username and use the information provided here at your own risk. Home Controls, Inc. takes no responsibility for the content or opinions posted here. Please keep these rules in mind as you use our blog. Thanks for participating.